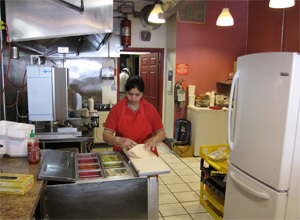 Maninder Kaur and Balbir Singh opened Tangy and Tasty at 75 McDonnell Street in December of 2009. The many reasons for this decision include the people who, after sampling their hearty and healthy food at the annual Multicultural Festival at Riverside Park, wanted to know where they could get the delicious fare all year round. Maninder and Balbir have been vendors at the Multicultural Festival since 2002 and have felt very supported by Delfino Callegari, the festival's director. Maninder likes her adopted city of Guelph. She moved here with Balbir in 2001 from Uganda, East Africa. Guelph is a secure, supportive city where people are concerned for each other. Much of this feeling is due to Maninder's involvement with the Shelldale Centre. She volunteers for the Better Beginnings Better Futures program, helping herself and many others find their way in their new community. Back to business, Maninder notes that among her key clientele at Tangy and Tasty are the wonderful youth of Guelph who appreciate the healthy halal food they serve. So much so that business has been steadily growing, primarily through word of mouth and with a little help from her son setting up a facebook page. "Good food speaks for itself," notes Maninder, "we've never advertised." Maninder and Balbir, not unlike many new to Canada, continue to face many challenges. Both have advanced degrees and both have struggled to integrate into the workforce in their fields of expertise despite years of education and experience. Both Maninder and Balbir put in many hours each day to make the restaurant successful. Maninder, ever the optimist, notes that "we are looking at a full glass with so many opportunities in how we can support ourselves in our adopted land."